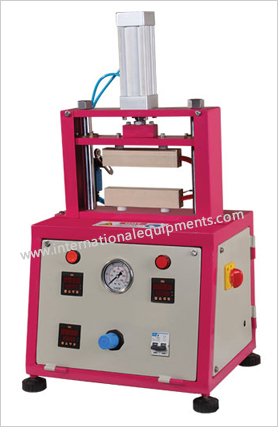 Heat Sealer is used in sealing plastic films, packaging materials. Many a times it is also called as Paddle sealer since in the new ages paddle foot switches are used to close the sealer platens for quick and easy operation. Mainly in the applications where quick plastic fusion is required at temperatures around 250 degree centigrade within small time durations such as 1 second or 2 seconds such HEAT SEALER equipment are used oftenly. Heat Sealers offered by us consist of CNC ground finished sealing blocks, these are most critical and precision oriented areas since if the sealing blocks are not finished thin films in lower microns such as 50 microns to 100 microns cannot show uniform sealing. Accurate pencil heaters and sensors are connected with two PID controllers having range up to 250 degree Centigrade and resolution of 0.1 degree centigrade are offered. Pneumatic cylinder capable to operate on pressure range from 1 bar(kg/cm.sq) to 5 bar (kg/cm.sq) are offered with settable regulator in order to increase and decrease pressure. Digital timer with range of 999.9 seconds and resolution 0f 0.1 second will be offered so as to cover wide range of films. This timer would control automatic release is of block after sealing.